HourCareers, a division of HireGround Software Solutions, is a dual-purpose career board designed to facilitate organizations’ career and job posting needs. This system offers a custom career board for organizations to manage their online job postings as well as invite their members and affiliates to post job openings on a central board located on their website. HourCareers system is offered as a SaaS (Software as a Service), meaning all is hosted and supported for your group. The annual fees include hosting, support and all the tools that you need to manage the job board. The system can be configured to allow a fee for each posting or to offer your affiliates/divisions/partners a complimentary service. Some job board providers take extended time to install an organization’s branding and usability. HourCareers can be up and running in little time – have your applications coming in a matter of days rather than weeks or months. Announce your jobs to a wide audience to receive more applicants by advertising your job postings to a range of job boards; all jobs are sent to the most common free boards across Canada. HourCareers fully integrates with your careers page; with this method your job postings are seamlessly integrated into your website design and company branding. There is no need to have applicants or job-posters visit an external webpage or link connection out of your website. Easily maintain your company branding and display of logos – accounts are easy to update with logos as desired for affiliates/divisions/partners postings. Systems configured to collect payment for postings make it easy to both post and pay for each job, along with tracking the payment. Secure gateways collect all typical payment types such as MasterCard, Visa and AMEX. Online payments are secure with auto invoices generated and sent to each purchaser upon completion of the transaction. The system allows multiple organizations or individuals to post jobs to your job board once they have created an account. 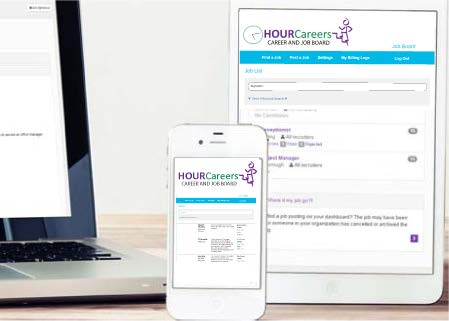 HourCareers is compatible for any type of device – desktop, tablet or mobile. It allows all users to work with the system – those posting jobs and candidates applying to them. HourCareers is the ideal job board tool for organizations with several operating units, members or affiliates wanting to advertise their job openings in one place such as School Divisions, Health Regions, Non-Profits, Educational Institutions, Chambers of Commerce, Airports, Associations or Municipal Districts. Choose whether to charge a fee when organizations want to post on the board or offer it as a free service to members or partners. Keep track of the activity on your job board by generating reports on user job posts as well as payment reports and tracking for those choosing to charge to post on their board.